Can you Lose Weight by Walking on Treadmills? YES you can. With these treadmill Workouts you can lose weight, shed body fat and strengthen your heart with cardio. Amazing benefits with these simple tips. Looks like suddenly Treadmills are the Weight Losers best aerobic friend! And why not? Treadmills have all the bases covered in terms of the criteria for the an Ideal Weight Loss Workout. Recall from the Best Aerobic Exercises Section how I described an ideal weight loss exercise - Any Exercises capable of raising your heart rate in the target zone and maintains it for 20 minutes is an excellent aerobic exercise. Treadmill certainly fits in to that criteria. Walking on treadmill has the same benefits as walking outdoors. Indoor workouts are possible on rainy days and in places with less space for walking or high traffic and pollution areas. Now-a-days treadmills come with a display monitor which helps many keep busy and avoid getting bored. Easy to use. 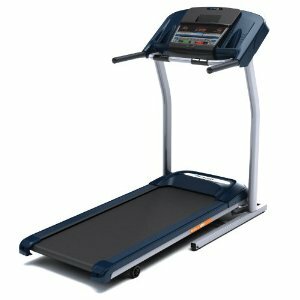 After an initial period of balance problems for a few, treadmills are very easy to use. Beginners should use the support bars for first few days to gain control over treadmill. Treadmills have cushioned bottoms making it easy on your legs. Perform a quick calf and hamstringsstretching routine of about 3-5 minute before you launch an attack on treadmill. If you are new to treadmill workouts you should ask the support staff at your gym for demonstration. Once you know how treadmill works, straddle your feet and start the running belt in case of electric treadmills. In manual ones your walk moves the belt. Make sure you hold on to the side bars for support. In manual ones all you need to do is start walking and maintain your chosen walking speed for at least 20 minutes. In electric treadmills you simply choose the speed and start the walk. Needless to say you should start at slow speeds and then progress from there. As your training progresses you can let go of the rails and swing your arms just like the way you walk. After 20-30 minutes you should reduce the speed slowly and level off before stepping out of the treadmill. Please never try and jump off the treadmill which is running. Want to Lose Weight and keep it off? The I highly recommend Burn The Fat Program By Tom Venuto.